‘But...’ I frowned. ‘But The Machine was evil, wasn’t it? It fed on people’s souls.’ He nodded gravely. ‘Hang on,’ I said. ‘Hang on a minute. Surely we’re in favour of good and opposed to evil. I really don’t see what I’ve done wrong here.’ Father Eschaton hesitated for a moment. ‘There is a balance...’ he began. ‘Why?’ I said. He shifted uncomfortably. Hah! It reminds me of the Star Wars prophesy about Anakin - that he'd 'restore balance to the force'. Yup, two Sith vs. thousands of Jedi is pretty badly out of balance. Good thing he killed almost all of them. Balancing the force wasn't supposed to mean two groups having equal numbers, but apperantly they either weren't clear or the audience was too obtuse. This very situation plagues RPG plots. It deserves to be skewered like that evil machine. 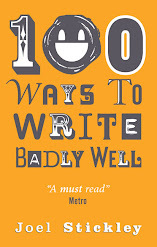 "Have your characters expound on the weaknesses you perceive in your own writing." Hee hee HEE. Love this. That is hilarious. If a whole book was like this, it would be a sure hit. @Mel V, I thought the "restore balance to the force" _meant_ he would kill all the good jedi... and bring balance to the force. I've been enjoying your blog all along, and I think this is my favorite so far. I've been trying to figure out why though. Maybe it's this: "Why not just have everything good and nothing evil? What’s actually wrong with that?" And the answer is, because it would be impossible to come up with plots after that. "Why not just have everything good and nothing evil? What’s actually wrong with that?" "The golden light seemed to be bothering him." Some people have actually tried to answer this question. It usually doesn't work out very well. Eve Forward's "Villains By Necessity" tackles this idea similarly. Except...well, the reasons are explained well enough for pulp fantasy. This is why having the two sides that have to be balanced being called "good and evil" never works. Instead, if they're Light and Darkness, or, even, Life and Death, well then there's a myriad of ways in which the supposedly "good" one being too powerful could cause problems. Villians by Necessity solves this problem rather well-even without the cosmic wave of destruction,even mundane totalitarianism would be frighteningly effective at crushing free will.The balance must be maintained or one side will suppress people's free will to prevent them from having the ability to help the "enemy".